The next task was to find out who Lily McDonald was, and in the process again the surname Doy came up. She was the younger daughter of Robert Bailey Doy and Jane Nelson. She was baptised in St Andrew’s March 7th1897, where she is recorded as Lily Doris Doy. The Birth Registration Index give gives a date of birth for Lily Dora Doy as the 3rd quarter of 1895 and the School Register gives her d.o.b. as June 2nd 1895. She started school on June 3rd 1900 and left 29th Feb 1909 to "home". All I can add is that his KOSB regimental number would have been issued around the beginning of 1917, so he would not have been serving with the regiment at the time of his marriage. 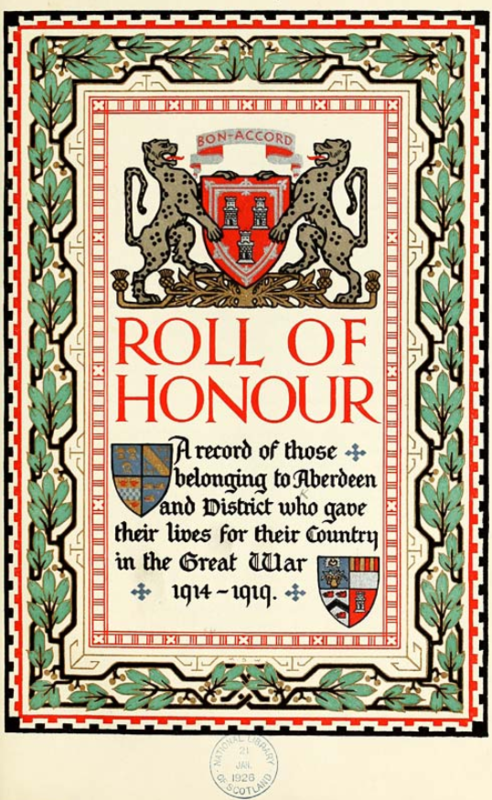 We have no record of the regiment's being stationed at or near Ryburgh at any time during the Great War. 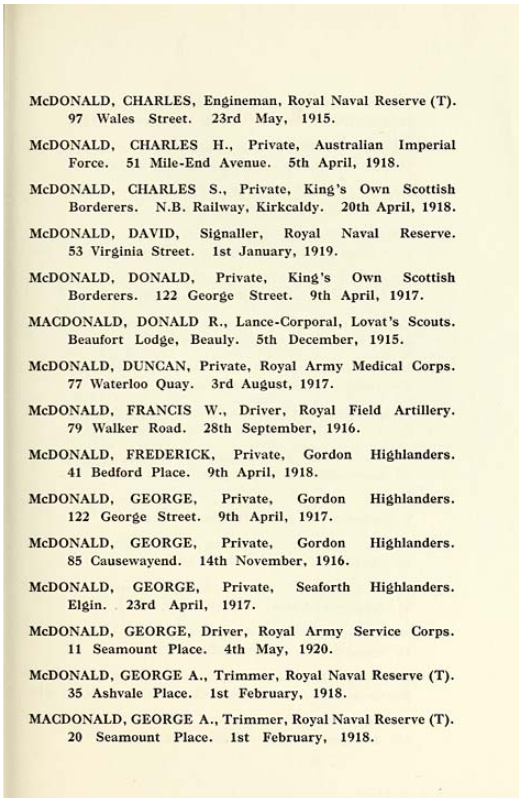 I don't know a great deal about the movements of 1/1 Fife and Forfar Yeomanry; they served on the Gallipoli Peninsula in 1915, but Charles McDonald was apparently not with them, as his medal card shows that he was not entitled to the 1914-15 Star. 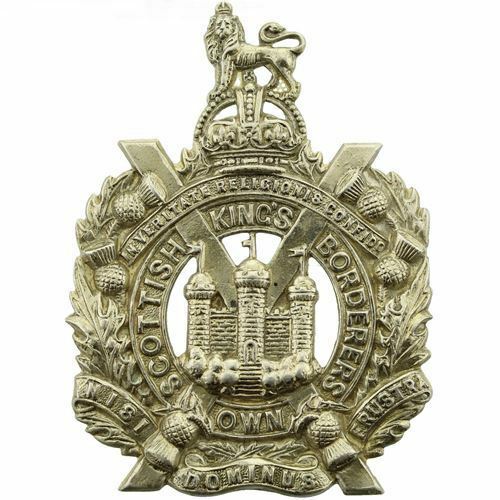 They were in Egypt from February 1916, and in December 1916 became the 14th (F & F Yeomanry) Battalion of the Black Watch. It seems that Charlie was in Gallipoli after all and was awarded the 14-15 Star. Steve Smith has sent me photos of his MIC via social media which confirm Charlie was with the F&F in the Balkans from 26 September 1915. Steve suggests that Charlie might have been injured or contracted an illness in Gallipoli. Note that on the medal roll, Charlie is with the 3rd F&F before joining KOSB. 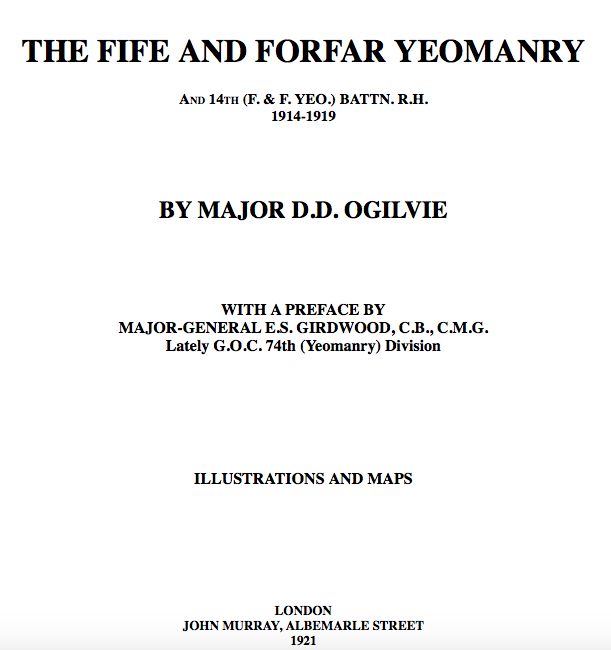 There were undoubtedly very many different troop movements and billetings in and around the village throughout the conflict and Steve Bushby has established that the Fife & Forfar Yeomanry, after a spell in and around Skegness were training in Fakenham during the spring and summer of 1915 prior to their posting to the Balkans in September 1915. 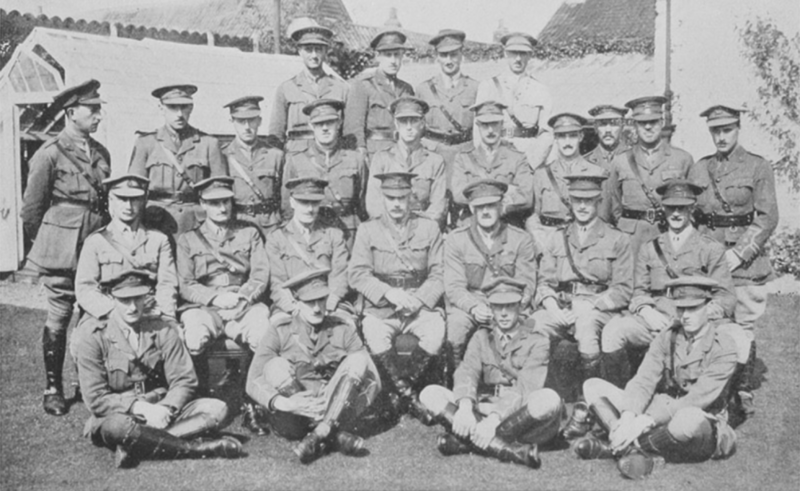 The following photographs come from a history of the Regiment that has been digitised as part of the Project Gutenberg. "From Lincolnshire we moved again south to Norfolk. King's Lynn was found to be unsatisfactory as a billeting area, so we trekked on to Fakenham which proved to be our final resting place in England. By now our training had so far advanced that we were not kept at it quite so hard, and we had more time for sports. We had polo, cricket, and all kinds of games, and on 3rd June mounted sports which were most successful. 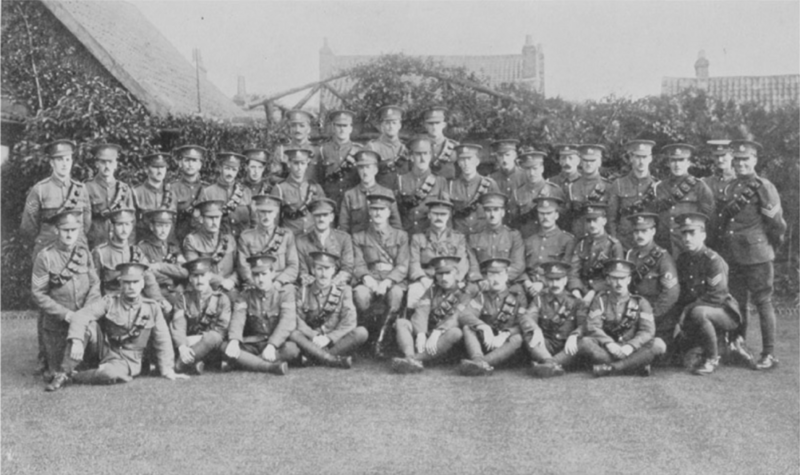 We spent the summer putting on the finishing touches, and did some very useful bits of training, including some fairly ambitious schemes of trench digging and planning, which proved invaluable later on, and which was a branch of knowledge in which many Yeomanries were conspicuously lacking. Also, by this time, a few courses of instruction had been started at the larger military centres, and we had several officers and men trained at these courses in musketry and other branches who were then able to pass their information on to the rest of us. We were given an army gymnastic instructor who brushed up our physical training--on which we had always been very keen--and also started to put us through a thorough course of bayonet fighting. There was also a busy time among our machine gunners, who trained spare teams up to nearly three times our establishment, which was invaluable, as it enabled us to take advantage of the chance which came to us of going abroad with six machine guns per regiment instead of three. As our usual role on Gallipoli was to take over with three squadrons, whose effective strength was never more than 100 each at the most, and generally considerably less, from four companies of infantry, each numbering anything from 150 to 180 strong, these extra machine guns were worth their weight in gold. By this time a good many were thoroughly "fed up" with so long a spell of home service, fearing that the war would be over before we got out at all. And it was not till nearly the end of August that we got definite news that at last we were to receive the reward of all our hard training and see service overseas. We were inspected and addressed by General Sir H. Smith-Dorrien. Our horses, that had done us so well on many a strenuous field day, that knew cavalry drill better than some of us, that had taken part in our famous charge with fixed bayonets on the common at St Ives, were taken from us and sent, some to our second line and some to remount depots. In return for a horse we were each given a heavy cavalry sword, presumably to prevent us being confused with mere infantry. On 5th September we said good-bye to our friends in Fakenham and started off on our journey for an unknown destination but--business. The last few days at Fakenham were busy ones, chiefly owing to the floods of new equipment which were at last showered upon us. 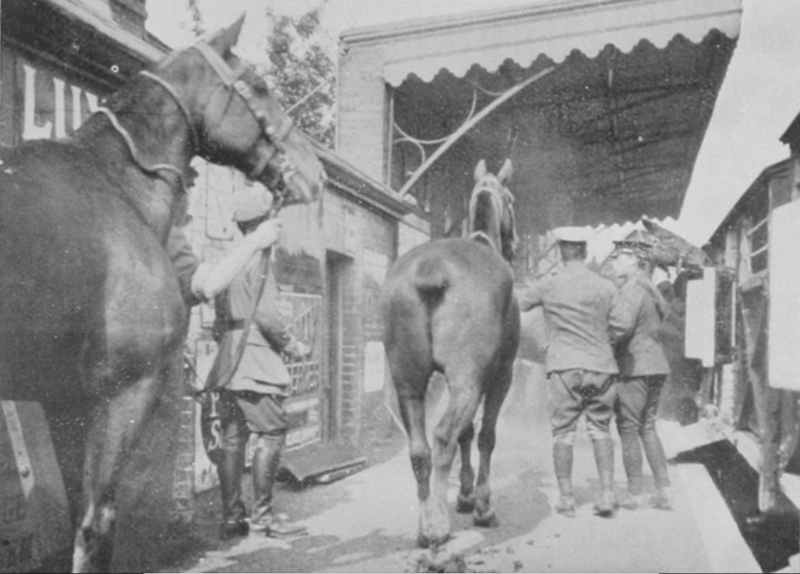 Two squadrons got a complete issue of new saddlery, harness, and vehicles, which meant, in the first place, handing over the old issues to representatives of the second line, and in the second place, assembling all the new saddlery (which was issued in small pieces) and packing it into sacks ready for the voyage. The rest of the saddlery was put on board without being unpacked. 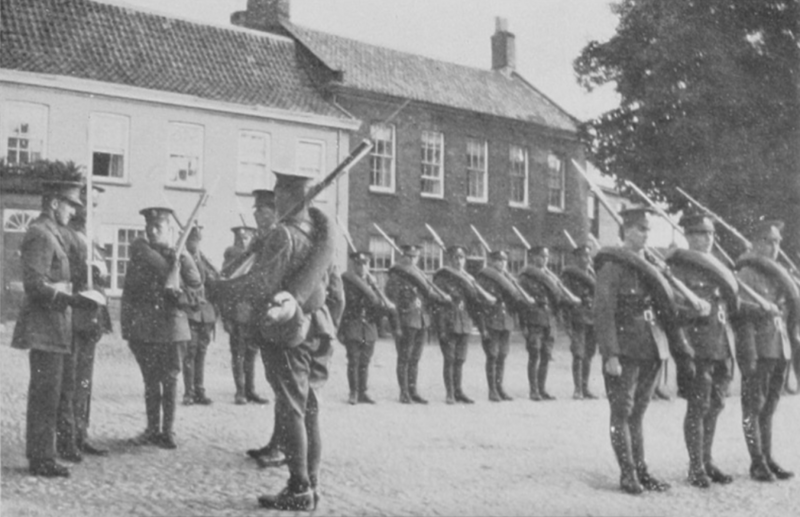 Then our complement of machine guns was increased from two to six per regiment, which meant taking from each squadron 1 officer and 20 men to form the new personnel, and replacing them in the squadrons with men from the second line. By this arrangement we lost also our adjutant, Captain M.E. Lindsay, who was made Brigade Machine Gun Officer. Lieutenant H.S. Sharp took Captain Lindsay's place as adjutant. All ranks were fitted with helmets (on which pugarees had to be fixed under the eye of the few old soldiers who had been abroad and knew how to do it), and also with a complete outfit of khaki drill clothing. This last caused no end of trouble and annoyance both to the tailors and the men. However, it was all finished somehow, and it was a very cheery party which embarked on the train at Fakenham station just after dusk. The entire population turned out to see us off and wish us luck, and gave us a very hearty send-off." By December that year the F&F were evacuated after a being devastated by bad weather and sickness. Read more about the F&F in Gallipoli here. Such circumstances must have led to Charlie's return to England, transfer to the K.O.S.B. and marriage to his Ryburgh sweetheart, Lily Doy. Equally, there is no evidence that she was living in the village when they met, and it would have been common practice to come back home for the birth of their daughter in the circumstances. As for his family, this has not proved easy to be absolutely certain, but so far, from the 1901 Scottish Census, things seem to point to a Factory stoker from 4 Stafford Street Rosemount Aberdeen. John and Ann A. McDonald, (the parents) with sons James 14, John 12, William 9, Charles S. 7, and Adam E.1 month. The address given on the War Graves Commission paperwork is now 43 Orchard St. Aberdeen. 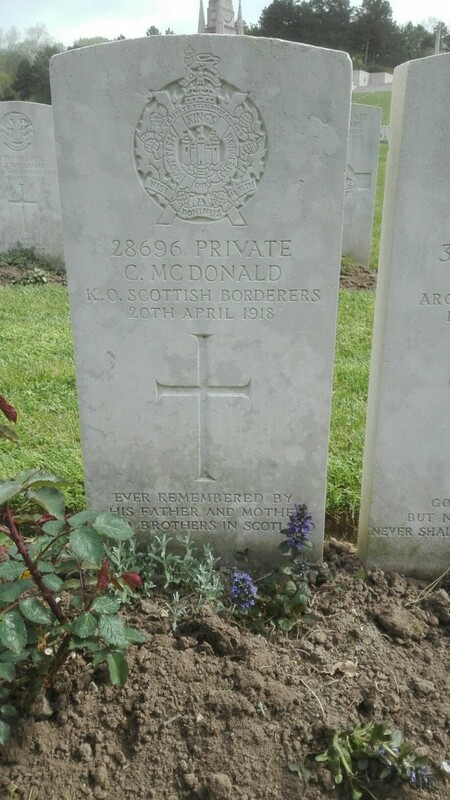 The photograph below of his gravestone has been most kindly supplied by the CWGC. From the Register of Soldiers’ Effects we learn that his widow Lily had by December 1919 received in total £30-16/-7d. in back pay and War Gratuity, £9-4/-4d of which is marked “for child”. The medal rolls and index cards tell us he was awarded the 1914-15 Star, British War and Victory Medals which were presumably sent to his widow. It is known that he enlisted in Kircaldy in Fife not far from Thornton Junction Station on the North British Railway where he worked. The K.O.S.B.’s war diary is available online, but we know nothing else of his Army career. Although it is not possible to know when he was wounded, there is a record of events on 17th April 1918 in the diary which are transcribed below. It possibly describes the action which claimed his life three days later as one of the 12 Other Ranks wounded. 1911 Census he was living at 158a Brown Street, Aberdeen, with father John, mother Ann and brothers William and Adam. Charlie 19 was working in a box factory. Lily McDonald married a Charles J Girdlestone when Annie was aged 7, at Wisbech Jul-Sep 1924. In the 1939 " Census" Lily Girdlestone was living at 1 Shadwell Road, Bristol. There was no sign of Annie (who'd be 22 by then) at the same address. Lily died Bristol Oct-Dec 1979. If anyone reading this can tell us more, please get in touch via this website. and thanks to Steve Bushby for his persistance in investigating Charlie's story.